Most companies are addicted to pumping out content, even though a bevy of research shows that’s not an effective strategy. According to the 2015 B2B Benchmarks, Budgets & Trends Report from the Content Marketing Institute (CMI), 76% of marketers say they’re creating more content in 2016 than in 2015. Why? Because In many cases, they don’t have a sound strategy for what they’re doing. Even worse, only 32% of marketers have a documented content marketing strategy. 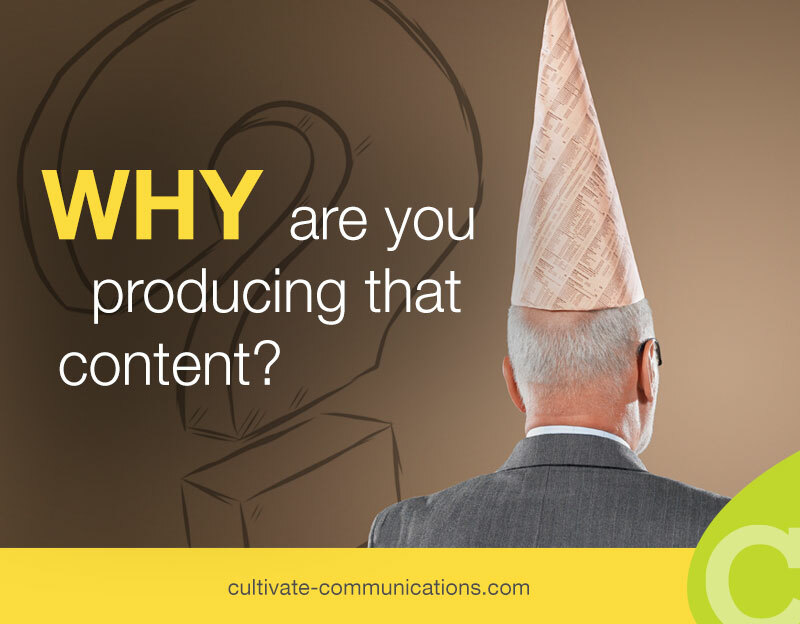 Content marketing seems like it may be important, so let’s publish some of it. We need to be everywhere online so our prospective customers can find us. So let’s create more of it, and promote it to every social media channel we can think of! But what many marketers don’t stop to think about is that all of this content represents a cost to the business. Someone – either internally or externally – needs to be paid to create, publish and promote it. It also has an opportunity cost: By doing A, you don’t have time to do B. In addition to time, you have to consider ROI. Is your current content making an impact on your target audience? Is it changing their behavior? Driving leads and sales? Helping you build relationships with them? Are they taking desirable action as a result of consuming your content? Why do we have a presence on (name your communications channel of choice)? Repeat this question for each of the channels where you’re currently publishing or promoting content. I think you’ll find it’s an eye-opening exercise! What is the business reason for us to participate in this channel? Do our customers and prospects use this channel? Is it an effective way of communicating with them? Is our content making a measurable impact on their behavior? Why are we promoting our products and services on LinkedIn Groups? Because several of them appear to match the demographics of our prospective customers. Why do these groups appeal to our prospective customers? Because they discuss business topics that help them be more effective in their work roles. Why aren’t we getting more engagement on our posts within these groups? Because “drive-by posting” isn’t an effective approach to group participation on LinkedIn. We need to actively participate and be helpful to other members there. Stop doing what isn’t working! The bottom line of this exercise is to help you stop doing the things that aren’t working. Focus more of your time and energy on those tactics and tasks that DO resonate your target audience and DO contribute an ROI to your business.